Are you facing a problem of how to ideally solve the issue of air-conditioning or cooling? Then contact the TRANE ČR company, real specialists in this field. Our cooling units are popular throughout the whole world and now you too can use their help while creating a pleasant environment in your company, hotel or industrial plant. Hospitals, restaurants or, for instance, companies full of employees have high demands on the air quality. Especially in hot summer days it is neccessary to regulate the temperature in such objects. However, purchasing an air-conditioning or complete cooling system is very expensive. That is why we have the perfect solution for you. 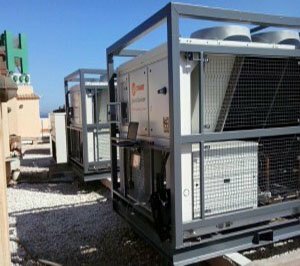 We offer long-term or temporary rental of cooling units. Even during a reconstruction or modernization of the existing systems you can thus provide a comfortable environment for your guests and employees. Rental of cooling units from our company is very convenient, because we will ensure also their professional assembly and the neccessary service. Hence, you do not have to worry about anything and can simply enjoy the fresh air and pleasant environment all year round.